Watch out! The spider monkeys want to throw gross slime balls at the city residents. 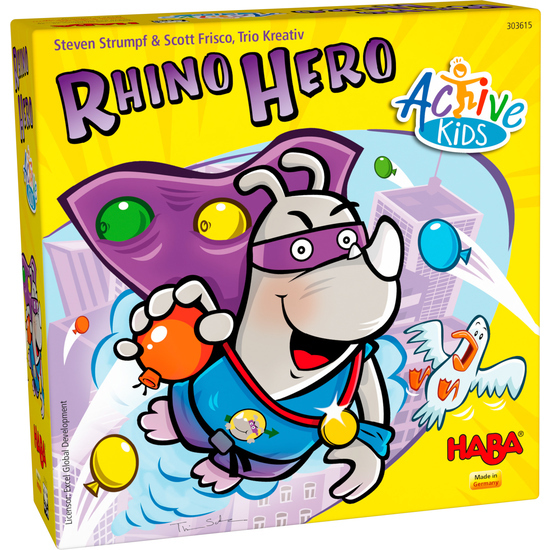 Rhino Hero and his friends are needed; players grab the slime balls and balance them on their super heroes’ cape, transporting them as quickly as possible to their hero headquarters. Heroes can't let themselves get flustered by the other players. They need skill and courage to carry more and more slime balls out of the city each round. Contents: 4 super heroes (Rhino Hero, Giraffe Boy, Big E. and Batguin; each made up of two parts), 4 supports, 4 hero headquarters, 24 slime balls (= acrylic balls), 3 boom dice, 1 set of instructions. Short game instructions: • Place the box base with all the slime balls in the center. Each player selects a superhero, puts it together, and sets it down in front of them with the associated headquarters. Have the die ready. Play in a clockwise direction. other players win. Then the next player takes their turn. • The first player who collects 6 slime balls on their superhero’s cape wins.